Ever wonder who many type of contact lens are there? Contact lens, like glasses and LASIK are the most common conventional methods of correcting refractive problems such as nearsightedness, farsightedness, astigmatism and presbyopia. Many people switch to wearing contact lenses as they find wearing glasses unattractive. Some switched due to special needs such as irregularly shaped cornea. You can often find people wearing cosmetic contact lenses during Halloween in hope to look like Edward Cullen. So how many types are there exactly? Based on the materials they are made of, there are mainly 4 categories of contacts: Soft, Hard, Rigid Gas Permeable (RGP) and Hybrid. This type of contact lens is most commonly used. They are soft and conform to the shape of your eye. Advertisements of these type of contact lenses always depict the importance of wearing them in the life of someone with an active lifestyle. I often wonder how can contact lens be safe for sports. The risk of sweat leaking into the lens and causes bacteria infection plus immediate eye damage from the lens if you do get an eye injury. None of these sounds safe to me. 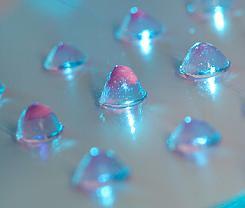 These contacts are made up of plastic which can incorporate water called hydrogel. The water content makes the plastic soft and flexible, as well as allowing oxygen to reach the cornea, keeping it healthy. Usually the thicker the lens is, the higher the water content. 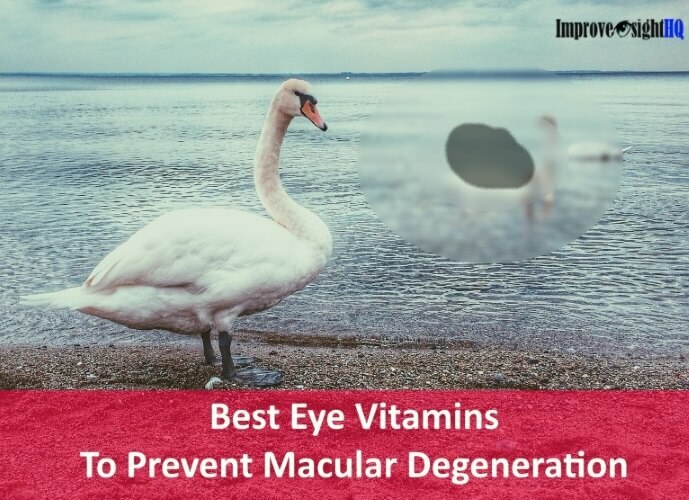 However, high water content also serves as a good breeding ground for bacteria which is why the existence of lens solutions to disinfect your contacts. Hydrogels are classified as either ionic or non-ionic. Untreated or ionic hydrogels have negatively charge surface which may attract proteins (positively charge) from your tear. The negativity of non-ionic hydrogels’ surface are minimized and therefore less prone to cause protein deposit. Most recently, silicone hydrogel is becoming more popular. Compared to the older materials, silicone hydrogel allows more oxygen to penetrate the cornea. In fact, studies shown that silicone hydrogel contacts can transmit up to 6 times more oxygen than the normal hydrogel. Daily wear - Designed to be worn for 2-4 weeks depending on the manufacturer. You remove them each night to clean and disinfect. Daily wear type are typically the least expensive option. Extended wear - For prolonged usage (up to 30 days) and can be worn over the night. Caution though as the longer you wear contact lenses, the higher the risk of abrasion and infection. Disposable - Simply use for recommended time frame and then throw away. The most expensive option and they do not need to be cleaned or disinfected. Toric Lens - Shaped with two curvatures to correct moderate astigmatism. They are available in both rigid and soft materials. Cosmetic Lens - Doesn't correct any form of refractive errors. Serve to enlarge the way your eyes look, change your eye color or the shape of your pupil. Purely for aesthetics value. The forefather of the different type of contact lenses today. 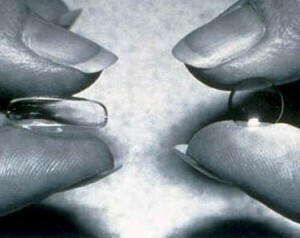 Hard contact lenses are made of a firm plastic material called polymethyl methacrylate (PMMA). These lenses are extremely durable and less prone to infection because they don’t sustain bacterial growth. And they are less likely to absorb foreign material from the eye or environment. They can also be tinted slightly for easier recovery if dropped. 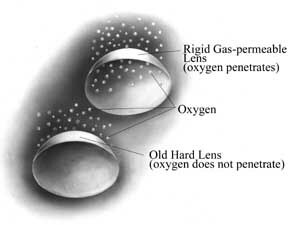 The biggest problem with hard lenses is the lack of oxygen permeability. 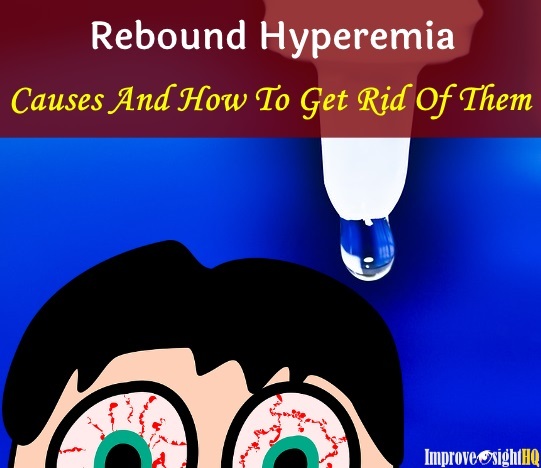 They restrict the flow of oxygen to the cornea, which needs oxygen to stay healthy. Today, this type of contacts is rarely used anymore. However, there are minorities who wear them for their durability and cheaper cost. This newer version of hard lenses combines certain features of both hard and soft lens. RGP lenses are made of rigid, water-less plastic combined with gas-permeable materials that allows more oxygen than hard lenses do, to pass through and reach the cornea. 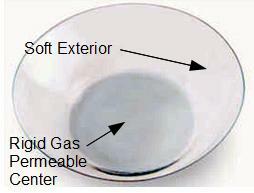 However, unlike soft lens, it contains very little or no traces of water. 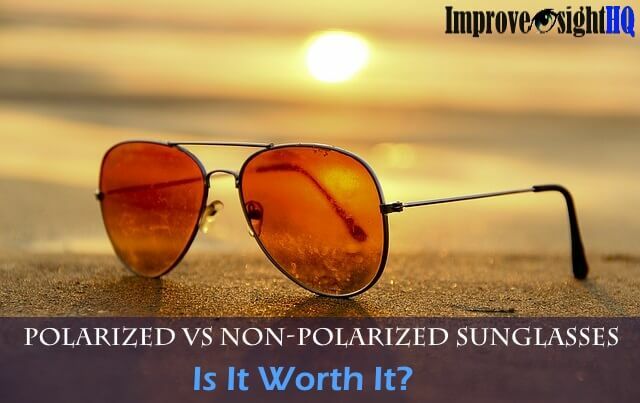 Due to its rigidity, they aren't always as comfortable as soft lens. Thus, much less popular than soft lens. However, they do have their own set of advantages. RGP lenses are smaller in diameter and often provide crisper vision than soft lenses. 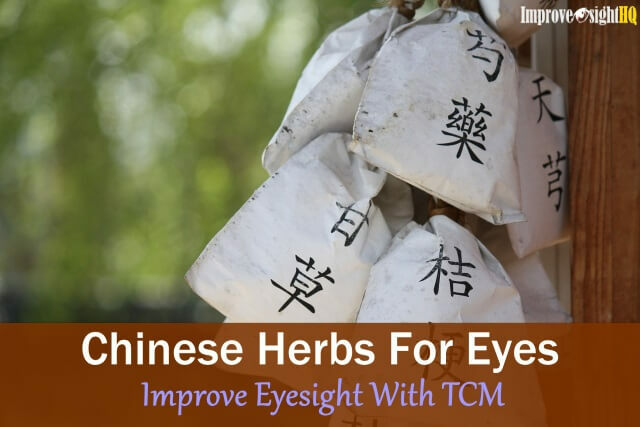 Also, It is especially helpful in correcting irregular astigmatism. A hard lens produces better vision because it flattens all of the corneal distortion, mimicking a new smooth optical surface to focus light. One common use of RGP is to reshape the cornea in attempt to correct minor degrees of astigmatism and nearsightedness. This procedure is known as Orthokeratology where the lens is worn over night. Your vision isn't corrected when you are wearing this type of contact lenses. Instead, you will observe your vision improve temporarily for several hours after taking them down as your cornea has been temporarily reshaped during sleep. 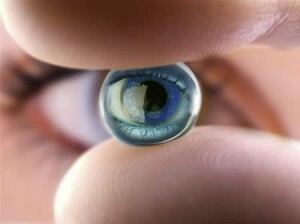 A new type of contact lens that is recently gaining popularity. Hybrid lenses are a combination of soft and RGP lenses. The hybrid lens is made up of rigid gas permeable materials in the center and surrounded with soft lens material as the outer ring. This creates a rigid center but soft surrounding skirt for greater wearing comfort. People who have certain corneal irregularity and wish to have clearer vision may consider using hybrid lenses if RGP is too uncomfortable for them. There are also other custom type of contact lenses which are less common and fabricated to use in special cases such as scleral gas permeable lenses for correcting keratoconus. Personally, I will strongly advise against wearing contact lenses for aesthetic purposes. The risks of wearing, which include eye infections and corneal ulcers which may lead to permanent blindness, just aren't worth it. 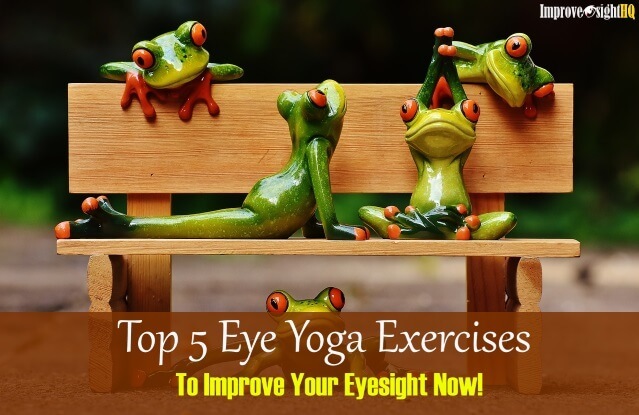 Glasses are safer but if you really want to improve your vision permanently without the dangers of LASIK, the eye exercises approach is way superior.